The volume of grey matter—an important brain tissue for information processing—was reduced by as much as 3.3% during spaceflights. Though some grey matter had been recovered by the 200-day follow-up, the loss was still detectable because preflight volumes of grey matter had not yet been reached. The volume of cerebrospinal fluid in the brain increased over the course of the spaceflight. Because this study was focused on assessing brain tissue volumes, it is not known if these changes influenced cognitive ability or behavior in the cosmonauts. In a study published in The New England Journal of Medicine, a team led by University of Antwerp neuroscientist Floris Wuyts outline the results of brain imaging tests administered on ten Russian cosmonauts. Wuyts’ team found that the volume of grey matter—an important brain tissue for information processing—was reduced by as much as 3.3 percent during the cosmonauts’ spaceflights. Though some grey matter had been recovered by the 200-day follow-up, the loss was still detectable because preflight volumes of grey matter had not yet been reached. 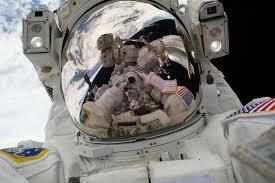 In contrast, the volume of cerebrospinal fluid circulating in the brain increased over the course of the spaceflight. Because this study was focused on assessing brain tissue volumes, it is not known if these changes influenced cognitive ability or behavior in the cosmonauts. Angelique Van Ombergen, a postdoctoral researcher at the University of Antwerp, told me it was “hard to say at this point” why the microgravity environment causes these shifts in brain tissue volume. The leading hypothesis is that microgravity causes more fluids to shift upwards toward the torso and head, because gravity is not anchoring them down. “We believe all the changes we see here are due to this fluid shift,” she said in an email to Motherboard. This conclusion could be related to the study’s curious postflight findings concerning white matter, a brain tissue coated in a lipid called myelin that increases the speed of nerve fiber impulses. Initially, it didn’t seem that spaceflight changed the volume of white matter at all. But when the team imaged cosmonauts months later, their white matter had decreased in volume. The researchers think that this could be due to long-term postflight changes in cerebrospinal fluid circulation, but they will need to conduct more MRI experiments to be sure. The researchers are already recruiting new astronauts and cosmonauts for more expansive studies about the influence of long-duration space missions on brain function. While this particular experiment did not find any negative effects on cognitive ability, Van Ombergen said that forthcoming research will zero in on that question with more precision.